The paper deals with the study of the interaction of the working body with the ground in order to achieve the borehole wall maximum density, which can be provided by a certain ratio of the actual speed of axial feed and the impact device output parameters. The idea of the scientific research is that after the impact the ground brought into the state of partial thixotropic softening should be statically deformed. This leads to the fact that the total plastic deformation range increases significantly, which will result in the ground density growth. Since the thixotropic softening process is limited in time and space, it is necessary to determine the relationship of the machine input parameters and rational values of the static effects, showing the ratio of static and dynamic soil loading. The results of laboratory experiments on the well formation modes study are given. Keywords: the drainage cavity in the ground, soil density, static-dynamic interaction, indicator static influence. Lazutkin S.L., Lazutkina N.A. Characteristics of static and dynamic process of formation of molehills // Engineering industry and life safety, 2012, № 1. − P.68-72. Malyasov V.V. 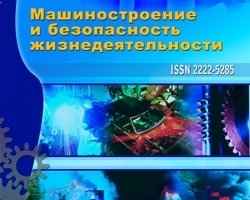 Investigation of the parameters of the system start-up power converter transport vehicles // Engineering industry and life safety, 2008, № 5. − P.227-229. Lazutkin S.L., Lazutkina N.A. Calculation of pressure on the surface of contact of the tool with the material // Engineering industry and life safety, 2010, № 7. − P.114-119. Lazutkina N.A., Lazutkin S.L. To a question of a design procedure of traction and high-speed characteristics of pneumowheel mountain cars with adjustable hydrovolume drive // Engineering industry and life safety, 2011, № 2. – P. 51-54. Lazutkin S.L., Lazutkin A.G., Lazutkina N.A. Mathematical model of the load on the executive body of the machine pulsed // Engineering industry and life safety, 2009, № 6. − P.121-124.